(CNSNews.com) - Americans on average spent more on taxes than on food and clothing combined in 2017, according to the Bureau of Labor Statistic’s new data on consumer expenditures, which was released this month. At the same time, according to the BLS data, the average consumer unit spent $7,729 on food in 2017 and $1,833 on apparel and services—bringing the total average spending for food and clothing for the year to $9,562. In fact, the 2017 average expenditure of $9,917 for income taxes alone—which includes the $7,819 for federal income taxes and $2,098 for state and local income taxes—was more than the average expenditure of $9,562 for food ($7,729) and clothing ($1,833). In 2017, there were 130,001,000 consumer units in the United States. These consumer units had an average before-tax income of $73,573 and their largest average expenditure was $19,884 for housing--a sum that included the average property tax bill of $2,065. Even though Americans spent more on taxes in 2017 than on food and clothing combined, the average 2017 overall tax bill of $16,749 was still lower than the average 2016 overall tax bill of $17,153. Also in 2017, Americans spent on average $7,203 on food and $1,803 on apparel and services—for a combined $9,006 on food and clothing. 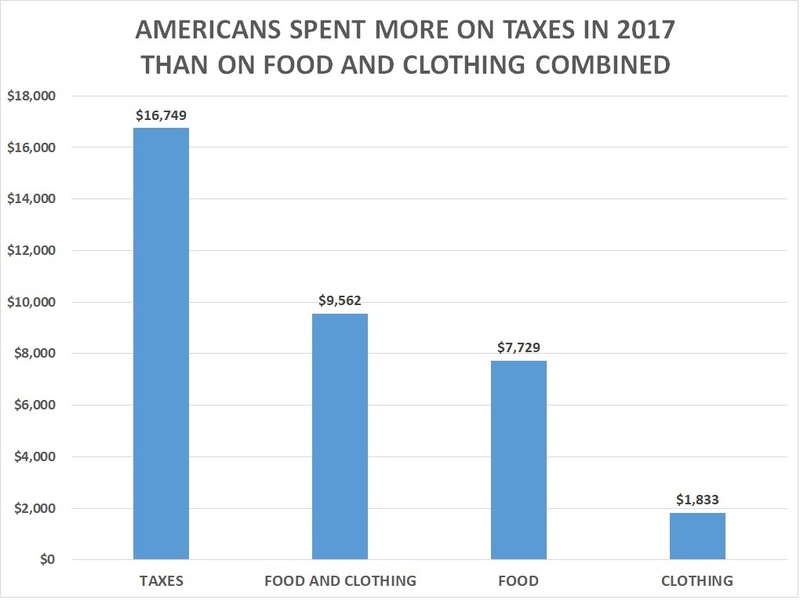 Thus, in 2016 as in 2017, Americans spent more on average on taxes ($17,153) than they did on food and clothing combined ($9,006).